The Natural Resources Committee heard testimony Jan. 17 on a bill meant to reduce the impact of streamflow augmentation projects on county tax rolls. Hughes brought an amendment to the hearing that would replace the bill. It would authorize NRDs and interlocal entities to make voluntary payments in lieu of taxes to the county. The amount of the payments would not exceed the property taxes that would have been paid on the land if it were subject to taxation. Hughes said the amendment would address two concerns about the Rock Creek Augmentation Project and the N-CORPE (Nebraska Cooperative Republican Platte Enhancement) project, an interlocal agency created in 2012 by four of the state’s NRDs. N-CORPE bought 19,500 acres in Lincoln County that it retired from irrigation so that it could pump groundwater into the Republican and Platte rivers to help the state meet streamflow requirements under the 2003 Republican River Compact, which allocates the use of surface water between Colorado, Kansas and Nebraska. Occupation taxes from irrigators within the four NRDs fund the project. The Rock Creek Augmentation Project acquired about 3,200 acres in Dundy County for the same purpose. The first of those concerns is the loss of property tax revenue to Lincoln and Dundy counties after the irrigated land was converted to grassland, which has a much lower value. Hughes said N-CORPE and Rock Creek have paid property taxes assessed by the counties but that they have done so in protest because it was not clear if a public entity serving a public purpose should pay property taxes. In July 2017, the state Tax Equalization and Review Commission ruled that N-CORPE was exempt from paying property taxes for that reason. Lincoln and Dundy counties appealed that ruling, and the state Court of Appeals is waiting to hear arguments in that case, Hughes said. He said his amendment, by allowing N-CORPE to make payments voluntarily, avoids that prohibition while helping to offset lost property tax revenue to the counties. 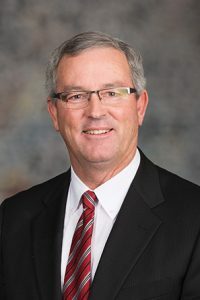 Hughes said the N-CORPE and Rock Creek projects are critical to ensuring the state’s compliance with the Republican River Compact and the Platte River Recovery Implementation Program, and he cautioned committee members against making major changes to the state’s water rights without consulting all stakeholders. Hughes said the amendment also would address a lack of public accountability for the N-CORPE project. It would require joint entities or NRDs to provide public notice of their intention to proceed with a water augmentation project and to hold a public hearing. They also would be required to publish an annual report on a project’s finances and activities, including the amount of water pumped. Terry Martin, chairman of N-CORPE’s board of directors and chairman of the Upper Republican NRD, which owns the Rock Creek Augmentation Project, testified in support of the amendment. Martin agreed that the N-CORPE project is instrumental in helping the state meet its obligations to Kansas. Without it, many more irrigators in the Republican Basin could have been forced to shut down. Conrad Nelson, vice president of the Wallace School Board, also testified in favor of the amendment. Most of N-CORPE’s land lies within the Wallace School District, he said, which has lost approximately $250,000 per year in property tax revenue because of the change in classification from irrigated cropland to grassland. Nelson said he was “mildly in favor of” Hughes’s bill because it would make up part of that shortfall. Kirk Olson, who lives in Lincoln County, testified in opposition to the bill. He said he does not oppose the N-CORPE project, but he questions why it has not had to pay property taxes at a higher rate. “If the augmentation project is still using the water out from underneath the land, why is it not taxed on the irrigated acre rate?” he said. 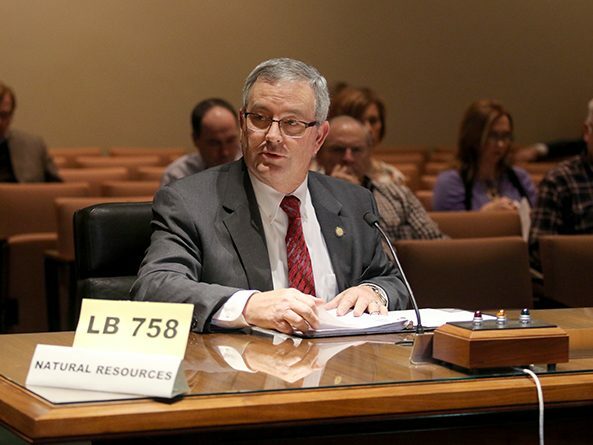 Olson said N-CORPE should instead raise its occupation tax on landowners within the 16 counties in the participating NRDs to offset the loss of property tax revenue to Lincoln County. Randy Robinson, who farms and ranches on land adjacent to the N-CORPE project, provided neutral testimony on the amendment. It would help protect counties, schools and other local entities from losing more revenue, he said, but it would not address concerns about N-CORPE’s management. Robinson said the project spends too much of its budget on managing the land, and he believes selling it to private owners while allowing N-CORPE to maintain groundwater rights would be a better plan.